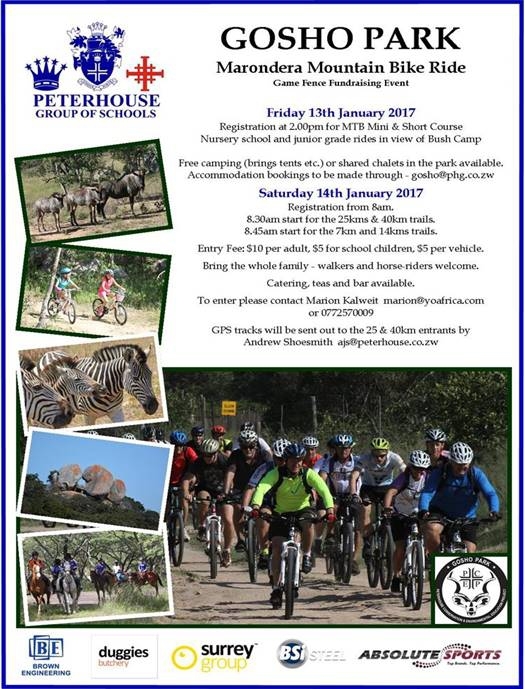 Gosho Park Marondera Mountain Bike Ride, Game Fence Fundraising Event. Entry fee: $10 for adults ,$5 for school children and $5 pe vehicle.Bring whole family, walkers and horse riders welcome. Catering, teas and bar available. Registration at 2:00pm for MTB mini and short course. Nursery schools and junior grades ride in view of Bush Camp. Free camping available (bring tents ect) or share Chalets in the Park available. Accommodation bookings to be made through gosho@phg.co.zw. Registration from 8:00am. 8:30am starts for the 25km- 40km trails. 8:45am for 7km and 1.4km trails. To enter contact Marion Kalweit marion@yoafrica.com. GPS tracks will be sent out to 25km-40km entrants by Andrew Shoesmith ajs@peterhouse.co.zw.